I''m so excited! This post heralds the beginning of a new page I've been thinking on for Craft Found. Altered Comicbook Clipart will house pieces of ComicBook Clipart that I have re-worked more than just enhancement and removal of text. 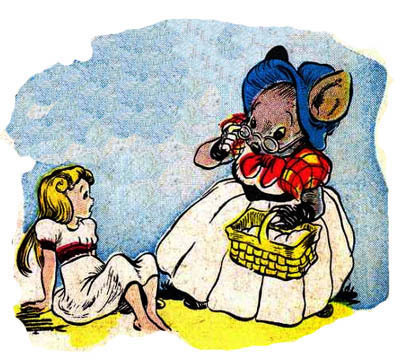 This wee gem of a pic comes from the original work of Artist: Walter Kelly. 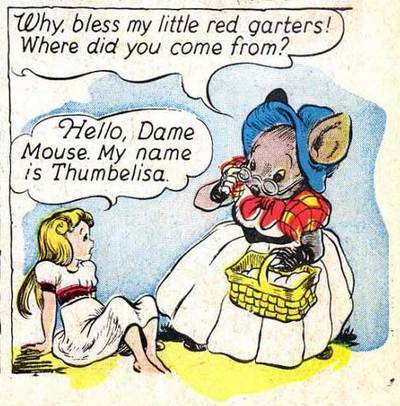 Featuring a kindly older woman mouse and darling wee Thumbelisa - based on the story of Thumbelina. I wish I could write that neatly - another thing to do on the personal to do list - sigh - wishing.